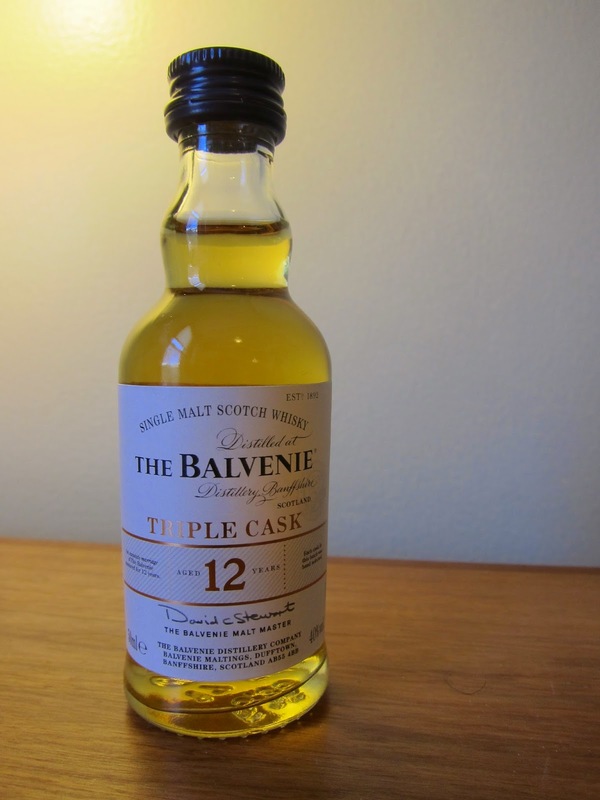 The Balvenie 12yo Triple Cask (40.0%): In spite of its little artisanal distillery fame (an amazing PR job I have to say...) The Balvenie is actually not a small distillery at all in terms of their volume of production. It annually produces a whopping 6.8 million liters (8th among all Scotch Single Malt distilleries) of alcohol for William Grant and Sons and it's also the 8th biggest selling single malt whisky in the world in terms of market share. What I have here tonight on my desk is a rather limited release though; their Triple Cask 12yo expression. Triple Cask is a travel retail only line launched in 2013 by. They are bottled at 12, 16 and 25 years and the whisky in the bottles is a vat of spirits matured in three different kinds of casks: first-fill ex-bourbon barrels, refill bourbon barrels and first-fill Oloroso sherry butts. After being married by David Stewart the whisky spends an additional six months in the marrying tun before it gets bottled. Color: Light amber, gold. Nose: Green Anjou pears, jonquils, peaches and lemon pound cake. Birch shavings, fresh pine nuts, apricots and banana cream pie. A little spring morning walk in the woods, honey comb, wet grass and candle wax. Palate: Salted whipped butter, brioche and allspice. Rosemary, cinnamon sticks and vanilla. Milk chocolate, spearmint drops and wax. Finish: Not loud, not long: White pepper dusting, hot chocolate with chili peppers, poached apples, candied orange zest and bitter lemon soda. Overall: I have to say that I enjoyed to see a Balvenie expression with less sherry influence and those refill bourbon barrels really made a difference. It's a fresh and vibrant whisky with an uneasy younger feeling but it is expensive. Way too expensive... Why is it that expensive? If you want to give a shot quite a few airports carry the 5cl bottles.